Which versions of the iPad work with the iO Mix? Will I have to buy a dock adapter to use iPad generation 2, 3, and 4? Does the iO Mix work with the iPad Air or the iPad Mini? Will the iO Mix work with an iPhone or iPod Touch? Is the iO Mix capable of recording all 4 channels simultaneously to my Apple Device? Does the iO Mix have a built in limiter for each channel? What type of inputs does the iO Mix has? How many channels of Phantom Power does the iO Mix have? Does each channel on the iO Mix have EQ settings? Is the iO Mix available in more than one color? The iO Mix is officially supported for use with iPad generation 1, 2, 3 and 4. The iO Mix includes a sled adapter for iPad generation 2, 3, and 4. You will need to remove the sled adapter to use the first generation iPad with iO Mix. There is no adapter available for the iPad AIR or iPad Mini. Many have used the iPad Air and iPad Mini successfully with iO Mix, however the iPad Air or Mini are not officially supported. Because of the size difference, they will not sit perfectly in the docking station. The iO Mix works with nearly all iPads, iPhones, and iPod Touches. However, the iO Mix is officially supported for use with the iPad generation 1, 2, 3, and 4 as listed above. Yes! 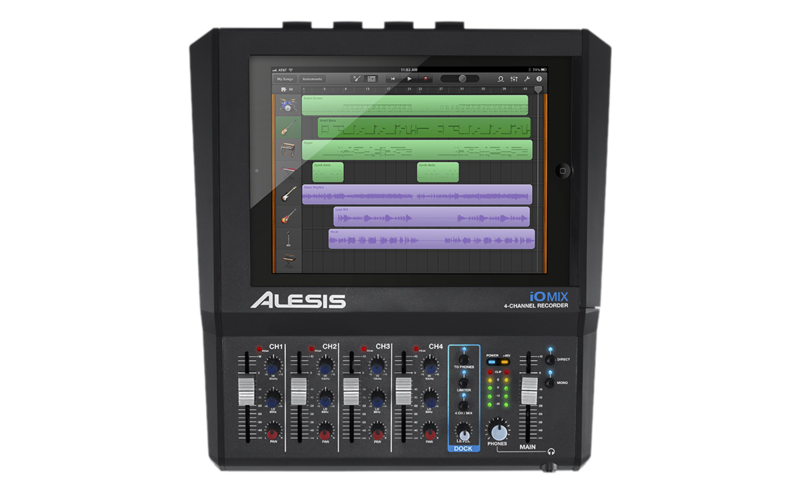 The iO Mix is capable of recording 4 channels of audio to your iOS application as long as the application supports multitrack recording. Yes! All four channel limiters activate when the LIMITER button is pressed. The iO Mix has 4 XLR/1/4" combo jacks for microphones and/or line level devices. There is also a GUITAR switch that will activate channel one to provide higher impedance for guitars and basses. Phantom Power is included with all 4 channels. Each channel has EQ adjustments for Treble and Bass frequencies. The iO Mix is available in a gray finish only.